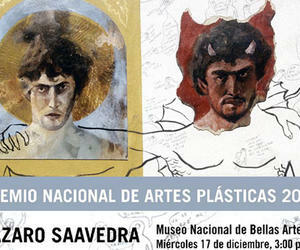 Lázaro Saavedra will receive the National Arts Award 2014 at the Museo Nacional de Bellas Artes in Havana tomorrow. Saavedra has been protagonist of the artistic movement of the visual panorama as an integrant of Group PURE and for three decades has developed a very diverse workforce in relation to the means of expression. This recognition of his career for his outstanding pedagogical work is also in the formation of generations of Cuban art students and his work is recognized both nationally and abroad. This time the jury that decided the delivery of that award was chaired by Eduardo Ponjuán, National Arts Award 2013, and composed also national awards of Visual Arts: Osneldo García, Pedro Pablo Oliva, René de la Nuez, Jose Villa Nelson Domínguez, Ernesto Fernández Nogueras and Ever Fonseca. It also included artists Iván Capote, Barreto and Abel Abel Barroso; Critics Award for Work of Life, Manuel López Oliva and art critics María de los Ángeles Pereira, David Matthew and Axel Li. In 2014 also resulted nominees, Lesbia Vent Dumois, Salvador Corratgé, Zaida del Rio, Roberto Salas, Juan Moreira, Pedro de Oráa, José Manuel Fors, Alberto Lescay, Alexis Leyva Machado (Kcho), Eduardo Roca Award José Antonio Choy (Choco ), Manuel Hernández Valdés, Rafael Zarza and Rocío García.